Use the form below to contact cruise Torre Agbar directly. A water company headquarters, next to Plaça de Les Glòries. This 144 m tall, 35-storey tower is “a geyser under permanent, calculated pressure” in Nouvel’s words (the reflections of the city lights on the glass cladding are a metaphor of water). The bullet-shape silhouette of the building takes its inspiration from a nearby, astonishing mountain called Montserrat (one of the legendary, iconic myths of Catalonia’s history), and the wavy, organic buildings of Gaudí (with a contemporary approach, of course). This fact discards any theory about the tower being a sort of replica of Norman Foster’s Swiss Re in London (even if there are some obvious formal similarities… phallic ones, if you want). 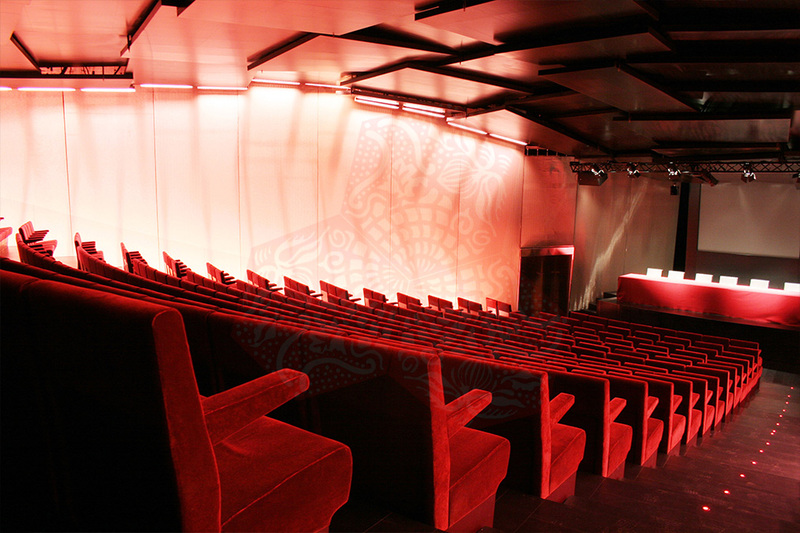 The color scheme on the concrete facade behind the glass louvres is an exercise of fractals applied to architecture and change randomly, from the earthly reddish colors on the basement, to the celestial blues on top, up until the dome where the facade tries to turn into an invisible skin suspended on the metallic structural grid. While the construction details are interesting -especially for the sort of Trombe wall (but with a different conception) defined by the glass skin and the concrete elliptical wall-, like a Seurat pointillist painting: the tower loses its illusory visual ‘touch’ as you get close to it. Quite remarkable is the nocturnal lighting, that saturates the tower’s colors and turns it into a spectacular kind-of lighthouse. Some critics qualify this tower as the city’s new architectural icon and say that it will substitute La Sagrada Familia as the great tourist attraction of Barcelona, we think they will share that privilege and preside over the city’s skyline together. “This is not a tower, a skyscraper, in the American sense. It is a more an emergence, rising singularly in the center of a generally calm city. Unlike slender spires and bell towers that typically pierce the horizons of horizontal cities, this tower is a fluid mass that bursts through the ground like a geyser under permanent, calculated pressure. The surface of the building evokes water: smooth and continuous, shimmering and transparent, its materials reveal themselves in nuanced shades of color and light. It is architecture of the earth without the heaviness of stone, like a distant echo of old Catalan formal obsessions carried by a mysterious wind off the Monserrat. · Program: 142 m highrise for the registered office of the company Aigües de Barcelona (AGBAR) + auditorium of 350 places | Client: Layetana Inmuebles S.L. With just two months until practical completion, Jean Nouvel’s Torre Agbar has risen to become a popular new landmark for residents of the Catalonian capital, Barcelona. While local architects intellectualize and debate the structure’s conceptual strength -as the pixellated concrete fuselage is steadily sheathed in multiple layers of profiled metal and glass louvres- for Nouvel and his team the facade’s apparent complexity condenses their vision of the tower as a fluid mass; a 142m geyser piercing the ground under a consistent and measured pressure. Set against the ever-changing Catalan skies, the facade possesses mirage-like qualities, as shades of colour, angles of inclination and degrees of opacity combine to mysteriously freeze the skin in liquid form, with depth, luminosity and reflectivity in constant flux. While work on site progresses, the internal spaces appear less delightful, with colour coordinated concrete walls compressed between relatively low ceilings. However, premature evaluations may be too hasty and, as internal finishes are installed, including stainless-steel soffits and window reveals, the creative drama of the facade may well percolate to the offices within. 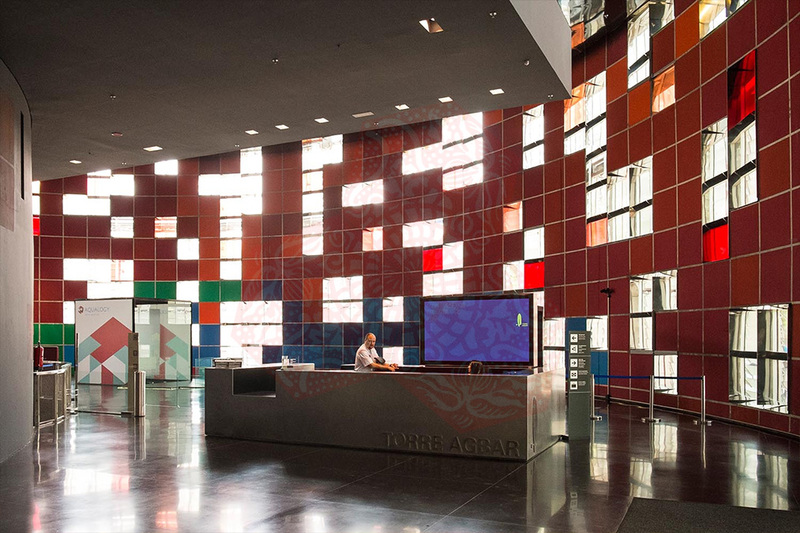 Meanwhile at the scale of the city, the building not only provides an impressive headquarters for the Catalan water company, the Agbar Group, but also serves as a beacon for the ambitious redevelopment of Glories – the city’s next major, and no doubt exemplary, civic transformation initiative. Do skyscrapers still make sense? Obituaries for the skyscraper were written after the terror attacks of September 11, 2001, targeted New York’s tallest buildings. It was argued then that tall, prominent buildings were too risky. It was said they made less sense in a wired-together world that is moving us toward—in the parlance—more “distributive” business models, making the centralized model of downtown obsolete. Tall buildings, instead, seem to be bigger news than ever. In Europe, skyscrapers are the lab benches for sustainable-technology innovation. In Asia—especially in China—not only are towers erupting everywhere, the quality level is ramping up rapidly, according to Brian Lee, a partner in the San Francisco office of Skidmore, Owings & Merrill. In terms of energy conservation and workplace amenity, in China, “the next wave of expectations is that the quality of constructed performance will be as good or better than any buildings around,” Lee says. The Jinling tower, proposed for Nanjing is only one of perhaps a dozen ultrasophisticated SOM designs in China. Asia is “the natural environment” of the skyscraper, said Carol Willis in a recent interview at Manhattan’s Skyscraper Museum, which she founded and directs. “Skyscrapers make sense where density and the urban infrastructure make it the logical way to occupy land.” High density is already an accepted norm in much of Asia. The huge boulevards and freeways being flung into the countryside around the biggest Chinese cities are accompanied by commuter rail lines and subways. It’s why, says Willis, “you see towers still going up in Hong Kong, Guangzhou, and the other high-growth cities.” The tallest, densest buildings rise over rail stations—preferably with airport access—whether in Hong Kong (KPF’s 108-story Kowloon Station Tower) or London (Renzo Piano’s 1,016-foot-high London Bridge Tower). European cities, traditionally hostile to tall buildings, are reinventing the skyscraper downtown. In London, decades of resistance to skyscrapers is crumbling, and perhaps a dozen new towers have been proposed in the historic center. Frank Duffy, of DEGW, a consultancy that tracks workplace change in both London and New York, put it succinctly: “The city learned it needs to have a diverse stock of buildings to survive.” More important, the center remains desirable, not merely for business efficiency but for prestige, and because the notion of needing to be at the center of things is far more ingrained in Europe. Central London’s new towers fall far from the developer norm, however. Like 30 St. Mary Axe, the towers are urbanistically polite: they are slim and not too tall (to avoid casting deep shadows on surroundings), and flaunt their use of sustainable technologies and efficiency-enhancing amenities (daylight, informal meeting places, individually controlled natural ventilation). One reason is that people working in today’s downtown tend to be highly paid specialists, and an amenable office has become part of what attracts talent. American developers and large tenants have resisted the thin Euro towers with their small floorplates. They are costly and you can’t gather enough people on a single floor, the argument goes. Some recent proposals address that criticism: Grimshaw’s Minerva building, Murphy/Jahn’s Deutsche Post tower, near Bonn, as well as the Highlight Munich Business towers mix amenity and space efficiency. “A skyscraper can be an acre on a floor, two dozen acres altogether,” says Ken Yeang, principal of Hamzah & Yeang, who has pioneered eco-towers in both temperate London and tropical Kuala Lumpur. “If you spread all that space out, you can only think of it in terms of urban design.” This leads naturally, he thinks, “to more amenities, more social opportunities.” Such tower innovations as sky gardens and atrium spaces for casual meetings over coffee are trickling into the U.S. market. Open stairs are tucked into the floor edges in the design Renzo Piano has made for the New York Times—encouraging idea-sharing by giving these meeting places the choicest real estate. Yeang goes farther, urging in his designs and his writings a mix of uses that collide in garden spaces chopped out of the tower bulk. (See Reinventing the Skyscraper: A Vertical Theory of Urban Design, 2002, John Wiley & Sons.) Mixing uses in towers, once rare, is rapidly becoming far more common. New York’s recently completed $1.7 billion, 2.1-million-square-foot Time Warner Center may take the prize for diversity. Behind its tinted-glass skin, you’ll find a four-level shopping center over a basement supermarket and health club. Two office chunks perch atop the mall, one devoted to Time Warner (including studios for CNN) and one tenanted. The just-opened Jazz at Lincoln Center glows in the middle from behind a five-story-high square of glass suspended by cables. A residential tower rises above Jazz to the south. The north tower includes a 251-room hotel and more condominium apartments. […] A number of towers on the boards express their mixed-use nature explicitly. Renzo Piano’s London Bridge Tower stacks a narrow spire of apartments above a hotel and a thick base for offices and retail, as well as a revamped rail station. The functions meet at dramatic skylobbies—visible from outside. Form elegantly transforms as it rises through different functions in SOM’s Jinling tower. The skyscraper has always been used to prove new technology that then spreads more widely throughout the building industry. The greatest focus recently has been on energy conservation, which can seem quixotic because everything about skyscrapers seems to demand conservation compromises: If you introduce more glass to use less electric lighting, you add heat gain. If you build shallower floors or add secondary glass walls for insulation you add a great deal not only to construction cost but to material used in construction. The narrow floor plates used often in northern Europe look inefficient because of the relative size of cores and structure. But the penalties for pursuing conservation are rapidly dwindling. Holistic analysis of “building physics” (now common in Europe) is displacing the traditional mechanical-engineering focus on cubic feet of air moved per minute. Advanced designs use the buoyancy effects of air in double curtain walls. They exploit diurnal temperature swings and manipulate building form both to encourage natural ventilation and to reduce heat gain. Advanced distributed-air systems reduce ductwork needs and shaftways, according to Matthias Schuler, of Transsolar, a pioneer in the use of nonmechanical means to achieve user comfort. This delivers lower floor-to-floor heights for the same ceiling height and gets more usable square feet per floor. Like many foreign tall-building innovators (Schuler is based in Stuttgart), he is optimistic enough about America jumping on the innovation bandwagon to open a New York office. By separating dehumidifying from ventilating and cooling, Schuler argues, cooling energy can be dramatically reduced even in the sealed buildings that prevail in hot, humid climates where the northern European natural-ventilation techniques don’t work. The tilt of units in the “shingled” curtainwall of a Murphy/Jahn tower he has collaborated on leaves space for fresh-air vents in soffits on each floor. If necessary, the air can be cooled or heated using miniaturized fan-coil units tucked beneath the floor. This “breathable” skin saves energy and simplifies and reduces the building’s mechanical requirements. Jean Nouvel takes solar protection yet another step in the Agbar tower in Barcelona. “I don’t believe the challenges are in making towers bigger, but more livable,” says Craig Schwitter, a structural engineer with Büro Happold in New York. Indeed a great deal of versatility can economically be incorporated into much lower towers. Concrete framing, for example, can permit geothermal cooling through the slab, according to Schuler, a scheme that may reduce cooling costs to almost nothing. With American companies generally looking to drive occupancy costs lower (and with first-costs remaining paramount), America isn’t ready yet to move to the forefront of tall-building innovation. The terror attacks three years ago—of all things—may have galvanized change in the slow-moving sensibilities of the real-estate industry. “Buildings can’t be seen as adversarial,” explained Schwitter. He argues that wary tenants and staff become more comfortable with working on high floors when they incorporate green space, when they minimize discomfort and make the most of daylight and fresh air. 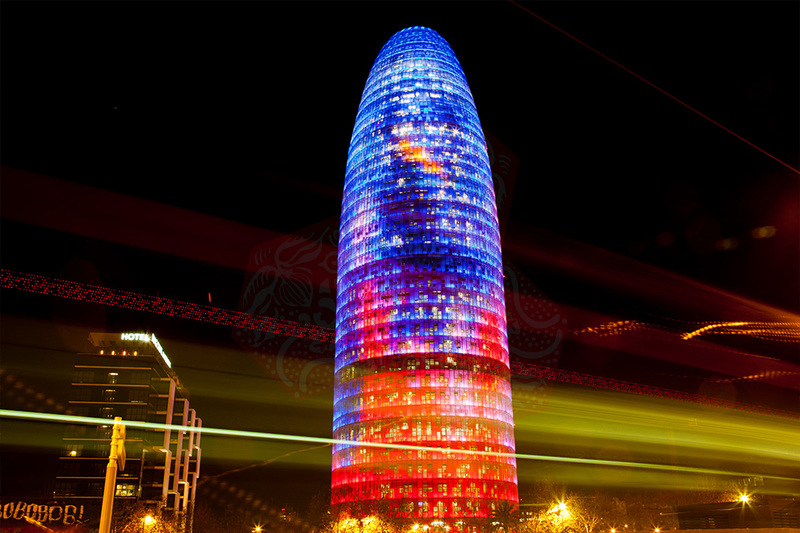 Acutely aware that the Agbar Tower rises in splendid isolation in Barcelona, architect Jean Nouvel has diaphanously veiled his wind-diffusing shape in an operable double wall in muted swirls of color. Within an exterior layer of tinted, pivoting glass, the thick structural inner wall shades operable glazing (sheathed in tinted metal mesh) from the powerful coastal light. The offset core and external elevator banks permit open, column-free floors. Construction finishes in mid-2005. Si una forma y una situación singulares se justifican en la configuración tan horizontal y de media altura de Barcelona es esta torre de formas redondeadas que señala la plaza de las Glòries. Visible sobre la retícula del Eixample, la torre Agbar emerge en el punto neurálgico de la ciudad y significa el hito de este vacío y nudo de conexiones. Casi terminadas las obras a finales del 2004, la inmobiliaria Layetana ha traspasado el edificio a su cliente, la Sociedad Agbar, que a mediados de 2005 finalizará el interiorismo y el acondicionamiento. Desde el mito de la torre de Babel y las torres medievales hasta los rascacielos fantasiosos irrealizables, cada ciudad ha pasado por la necesidad de tantear el límite imposible de la altura. En su novela El arquitecto de los hielos (1995), el escritor francés Marc Petit narra la relatividad del inicio de la línea del cielo; cómo cada animal, persona o ciudad lo ve desde un punto de vista distinto. La línea imaginaria del comienzo del cielo varía enormemente: “Siempre el cielo empieza allí donde llega la torre“. En este caso, la tipología genérica del rascacielos se ha intentado contextualizar con referencias locales -las geometrías orgánicas de Antoni Gaudí y las rocas erosionadas de Montserrat- y con metáforas -la forma de un géiser, la textura del agua-. Al mismo tiempo, la torre Agbar pertenece a la sistemática evolución de la arquitectura de Jean Nouvel y constituye una versión reducida y pulida de la Tour sans fin, pensada para la Défense de París (1989-1994). En su territorialización, el proyecto de Nouvel se inspira en el rascacielos que supuestamente dibujó Antoni Gaudí en 1908 para unos ricos empresarios hoteleros de Nueva York, el hotel Attraction, el que su discípulo Joan Matamala redibujó en 1956, y el que Rem Koolhaas rescató y publicó en 1978 en su mítico libro Delirious New York, que todo arquitecto culto conoce.Un juego aleatorio de ventanas convierte la fachada continua en una especie de ajedrez electrónico. Este atractivo tablero de luces en el muro cilíndrico de hormigón está calculado a partir de unos criterios de distribución e iluminación natural que, según el ábaco solar de Barcelona, sitúan más ventanas en el lado norte y menos en el sur, para poder tener una luz uniforme. Pero si de lejos la torre deslumbra, de cerca decepciona. Por su ambigüedad estructural, porque no se han sabido continuar en la cúpula las directrices verticales de la torre y, sobre todo, por la tan deficiente y abrupta entrega con la ciudad, con el nivel de la calle, con unas aceras, suelos, barandillas y marquesinas totalmente ineptos. Por su altura y porque el volumen cilíndrico actúa a la vez como fachada y como soporte, estructuralmente es de una enorme complejidad. Los grupos de ventanas predominan a veces allí donde la estructura perimetral debe resistir más. Por tanto, ha sido necesario inventar un sofisticado sistema estructural en forma de cruz que sea a la vez estructura y marco de las ventanas. Todo ello hace que la estructura sea un híbrido: estructura portante de hormigón armado en todo el cuerpo del edificio, que tiene forma elíptica pero que, sin embargo, utiliza vigas tradicionales formando el forjado, y estructura metálica en el remate: una cúpula acristalada y redondeada que roza las nubes. Pero una vez en su interior, el edificio recobra su sentido espectacular: ser la mejor atalaya. Predomina una planta libre, con el núcleo excéntrico de ascensores e instalaciones, una superficie media de unos 1.100 metros cuadrados y una altura útil bastante baja. En este espacio comprimido como un sándwich, la luz natural entra por las ventanas cuadradas, que se convierten en cientos de visores que enmarcan las mejores vistas. En el proyecto y puesta en obra se ha hecho un esfuerzo especial para que, mediante el recubrimiento de la chapa de colores, se genere la policromía de reflejos y vibraciones de la fachada, y, al mismo tiempo, para que la luz natural penetre en el interior de la manera más efectiva, dramática y cinematográfica posible.La torre Agbar se erige como monumento a la ambigüedad contemporánea. Emerge, pero sus formas curvas quieren desvanecerse. Es vertical, pero se quiere hecha de masa fluida, como si fuera un géiser a presión, permanente y dosificada; con una superficie que, evocando el agua, quiere ser lisa, continua y vibrante. Es el típico objeto moderno aislado, que celebra su autonomía y prepotencia, pero, al mismo tiempo, se pretende camuflar y desmaterializar tras una cortina de efectos ópticos, reflejos y brillos, transparencias y velos. Un rascacielos que es como las gigantescas columnas celebrativas de los romanos, coronadas por capiteles y envueltas por narraciones helicoidales de batallas; como las enroscadas columnas barrocas o las chimeneas de la industria; como el proyecto de rascacielos en forma de columna dórica que propuso Adolf Loos para el concurso delChicago Tribune en 1922, sobre la base de un gran mausoleo escalonado. Y la semejanza al órgano sexual masculino o a un gigantesco supositorio la convierte en una torre inquietante, que eleva un deseo latente. Inevitablemente híbrida, esta gruesa y gigantesca columna culminada por una cúpula corona una Barcelona cada vez más globalizada y anónima, genérica y cosmopolita. En el horizonte de su perfil al mar, sobre el llano construido, resplandece este rascacielos puntillista, emblema de nuestra condición actual: ambigua, reencantada y amnésica. The nearly completed Torre Agbar shoots up from the architectural indifference of the Glories district of Barcelona like some vertiginous crystal fountain. This seems appropriate: the eye-catching tower is the new headquarters of Agbar (Aigües de Barcelona), the company charged with running the city’s water supply, as well as its sewerage and other civic activities including health care provision, vehicle inspection and tax collection. This, though, is not what will interest most British visitors to the Catalan capital. They will surely think that Norman Foster’s media-stealing Swiss Re tower, aka the gherkin, in the City of London, has been miraculously uprooted and replanted beside the Mediterranean. At first glance, the two conical skyscrapers do, indeed, appear to be twins. 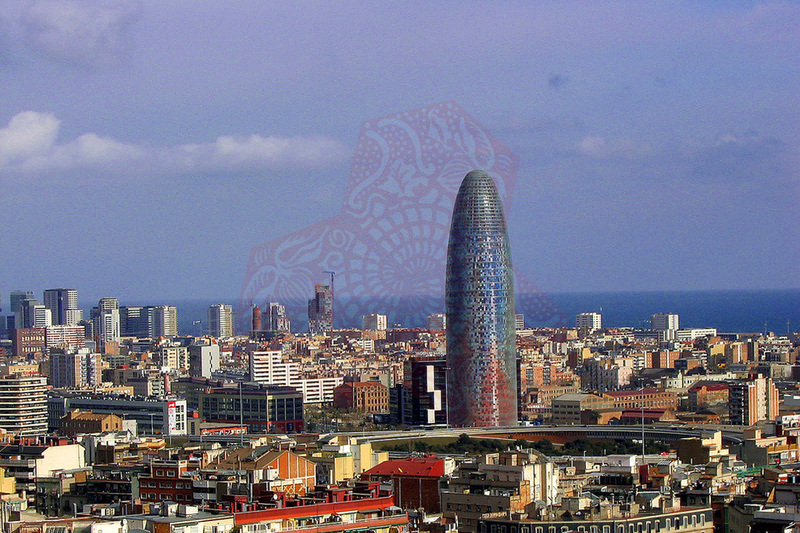 But get closer to the Barcelona tower, and the differences reveal themselves. Designed by Jean Nouvel, architect of the jewel-like Institut du Monde Arabe and Fondation Cartier in Paris, the shimmering 31-storey, 144m (474ft) Torre Agbar is shorter, narrower and half the volume of Swiss Re. Where the structure of the London tower is an exposed and gleaming diagonal steel grid, Torre Agbar’s is a thick concrete shell wrapped in a skin of profiled aluminium sheeting and a diaphanous blouse of glass louvres. While Swiss Re is hemmed into a tight City of London site, cheek-by-jowl with Colonel Siefert’s Tower 42 and Richard Rogers’ Lloyds Building, the £91m Torre Agbar overlooks a broad roundabout where Avinguda Diagonal meets Carrer Badajoz, and soars over a sea of piecemeal low-rise development.A blaze of colour, Torre Agbar is Foster’s tower on holiday. It looks wonderful at sunset as the reds, oranges and blues of its inner skin catch the sun and blaze through a myriad of tiny glass screens. In a certain light, the tower really does look as if it might be made of water, or light or fire. This is the tower the French architect, far from apeing Foster, has been trying to build for many years. At the end of the 1980s, Nouvel proposed a skyscraper the height of the Eiffel Tower in the guise of a chameleon-skinned glass cylinder rising from the brute concrete, steel and glass banality of La Defence, the monumental office quarter brooding at the western end of the Champs Elysees. The building would vanish ethereally from sight as it merged into the sky. This glorious conceit, or optical trick, was named “Tour Sans Fin”: in theory you would never be able to make out where it stopped and the sky took over. Sadly Nouvel never did get to build the Tour Sans Fin, yet here in Barcelona he has captured some of the promised beauty of that magical design. By sheathing the Torre Agbar in a sparkling skin that captures, reflects, refracts and toys with light, he makes the building seem far more delicate than it really is: this is the tall building artistically reconsidered. It is also a surprisingly delightful addition to the Barcelona skyline, which boasts fewer than a handful of tall modern buildings. Down on Carrer de la Marina in the Vila Olímpica are the 154m-high Hotel Arts, designed by Bruce Graham of Skidmore, Owings and Merrill, and the matching Torre Mapre, also completed in 1992, by Iñigo Ortiz and Enrique Leon. Dwarfing them, high on Tibidabo Hill, is the 288m Torre Collserola (1992), a communications tower designed by Norman Foster. The central tower of Gaudí’s expiatory temple of the Holy Family -Sagrada Familia- will dwarf them all when complete in a future as unseeable as the top of Nouvel’s Tour Sans Fin would have been. Nouvel has conjured an office block for a public utilities company into something as special as one of the prickly towers of the Sagrada Familia itself. The plan of the building, although interesting for being elliptical, is pretty straightforward: floor after floor of offices. Even the cone at the top shrouds nothing more exciting than eight floors of free-standing offices rather than the Ken Adam-style restaurant and bar at the top of Swiss Re in the City of London.Even though the building, engineered by Robert Brufau and Obiol Moya, promises to be frugal in its use of energy, and offers no fewer than 4,400 opening windows -a novelty in the age of the hermetically sealed, germ-laden, foul-breathed downtown office block- it is its remarkable skin, that will draw public attention. Nouvel is a master of surface design. The abiding memory visitors have of the Institut du Monde Arabe in Paris is of the buildings’s extraordinary south-facing wall: between sheets of glass, exquisite metal irises in the guise of traditional Islamic patterns open and close like human eyes to control the intensity of daylight entering the building. Here, in one act of design sorcery, art, architecture, history and technology come together. Meanwhile, the Fondation Cartier performs another of Nouvel’s disappearing tricks: this gallery is almost transparent, rising gently behind a sequence of screens that confuse our notion of where structure begins and ends, of what is substantial and what is simply a trick of light. More recently, the Cultural and Congress Centre (1999), on the lakeside at Lucerne, Switzerland, shows this master of translucency at his best. Lapping water and parades of boats are reflected from aluminium panels flanking three separate structures housed under one vast, sweeping plane of a roof. As you approach the shore by boat, the building emerges almost ethereally from its mountain backdrop, becoming distinct only as you come in close. The least ethereal aspect of Torre Agbar is its dense concrete core, from which the steel and glass cone emerge, as if freed from its weight, above the 25-storey line. This solid core promises to make the building not just secure, but economical in terms of energy consumption. The concrete will absorb heat in summer and retain it in winter. Nouvel has created a building that is at once practical, solidly down-to-earth and, despite its scale, soaring, lightweight and -on certain days, in certain lights- lyrical. Barcelona inauguró ayer un nuevo símbolo de la ciudad. La torre de Aguas de Barcelona, un imponente edificio de 142 metros de altura de forma cilíndrica que apunta al cielo, se levanta donde hace más de un siglo el padre de la trama moderna de la ciudad, el urbanista Ildefons Cerdà, situó el centro de la ciudad. Los Reyes inauguraron el que se ha convertido en el tercer edificio de altura de la ciudad, tras las la torre Mapfre y el hotel Arts. La torre Agbar, diseñada por el arquitecto francés Jean Nouvel, es además todo un símbolo de la fortaleza de la compañía. Algo que destacó singularmente su presidente, Ricard Fornesa, en pleno debate sobre la OPA de Gas Natural a Endesa: “Hemos crecido sin recurrir a fusiones. Por nosotros mismos“. Fue una inauguración peculiar puesto que 600 empleados de la compañía trabajan ya en las oficinas desde el pasado mes de julio. Pese a ello, ayer hubo nervios y expectación, tanto fuera como dentro del edificio, por la presencia de los Reyes y del amplio séquito de invitados, hasta 250, encabezados por el presidente de la Generalitat, Pasqual Maragall. La torre de Aguas de Barcelona se alza en la nueva Diagonal, abierta hace seis años, en una zona en transformación al mudar el suelo industrial que fue durante el siglo pasado a una combinación de sector terciario -oficinas y hoteles- con empresas de la nueva economía y zona residencial. La torre fue proyectada, en consecuencia, con una decidida intención rupturista. Y el encargo del grupo Agbar y la inmobiliaria Layetana -la promotora que ha invertido 132 millones de euros- recayó en un arquitecto que tiene gala precisamente de ser rompedor: Jean Nouvel. De momento, esas pruebas convierten la torre en una inmensa antorcha que cambia de color: rojo, verde o azul. Si el edificio ya es espectacular de día, todavía lo es más de noche. Una de las singularidades de la torre de Aguas es que es un cilindro que se cierra en cúpula en las últimas plantas. Una forma fálica que ha suscitado -y seguro que lo seguirá haciendo- sobrenombres de lo más variopinto: obús, torpedo y otros más procaces. Tiene 34 plantas sobre rasante -tres de ellas técnicas- que culminan en una cúpula acristalada y cuatro subterráneas con un auditorio con capacidad para 300 personas. De los ocho ascensores, seis están en la fachada que se orienta a poniente de la ciudad, desde los que se ven -parece como si se acercaran progresivamente conforme se asciende -las torres de la Sagrada Familia. La espectacularidad del edificio no es sólo exterior, donde los colores de su piel, recubierta por cerca de 60.000 placas de cristal, se degradan de los rojizos y tierra de las plantas inferiores a los grises y azules de las alturas. Una degradación que, no obstante, se percibe mejor desde cierta distancia. Por dentro no hay paredes porque la columna vertebral de la torre es el cilindro interior. Las plantas son diáfanas y perforadas por 4.400 ventanas que dan una luminosidad total a las oficinas. Caminando por el interior de ellas -en especial por las más altas- se obtiene una panorámica de 360 grados de Barcelona. El cálculo estructural de un edificio sin columnas de la altura de la Torre Agbar es un reto arquitectónico. Dispuesto en dos cilindros no concéntricos de planta ovoidal, de hormigón hasta la planta 26 y con perforaciones arbitrarias de 4.400 ventanas, este edificio requería una solución avanzada que no aportaban los tradicionales métodos de cálculo. El despacho de diseño y cálculo de estructuras Boma, encargado de esta parte del proyecto, lo solucionó mediante el programa informático RamSeries, único en su campo, creado por la empresa española Compass Ingeniería y Sistemas, explica Agustí Obiol, socio fundador de Boma. Cuando toda la geometría de un edificio es muy ordenada se sabe muy bien cómo funcionan los esfuerzos de pilares y vigas, pero con la Torre Agbar se encontraron con un montón de ventanas situadas arbitrariamente, en un tablero de cuadrículas de 0,92 metros, como si se tratara del juego Hundir la flota. A partir de la geometría del plano original y de los materiales a utilizar, el ordenador calcula la estructura completa y ofrece una visualización de cómo se comportaría el edificio globalmente, desde la cúpula de vidrio y acero que corona la obra hasta el cilindro interior que alberga escaleras, ascensores especiales e instalaciones. La simulación informática deparó sorpresas: aparecieron las zonas donde la estructura fallaba y era necesario corregir. En algunos casos, se trataba de cambiar la situación de alguna ventana. En otros, de introducir refuerzos; “por ejemplo, las aristas de ventanas de pisos de alturas distintas que coinciden entre sí se convierten en áreas débiles que pueden llegar a soportar una carga de hasta 300 toneladas“, explica Obiol. Boma propuso colocar un aspa metálica de dos centímetros de grosor entre esas ventanas para que la carga pasara a través de ella. Generar el modelo informático definitivo de la estructura de la Torre Agbar costó a los especialistas alrededor de un mes y medio. Una propuesta de estructura suponía invertir un sistema de ecuaciones de un millón de incógnitas; unas diez horas de cálculos informáticos. Una incógnita es la deformación que se produce en un punto de la estructura de la torre; en total, se analizaron 150.000 puntos distribuidos por todo el edificio. Boma también utilizó este programa informático para calcular la estructura del edificio triangular Fórum de Barcelona.